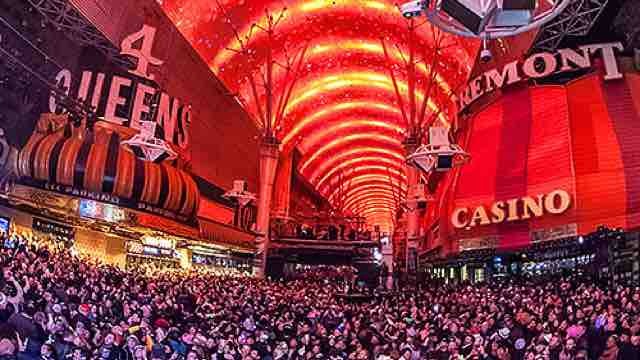 There are no shortage of reviews on Tripadvisor and Yelp claiming the Fremont Street Experience to be no-kids' land, and those old reviews from yesteryear were correct. 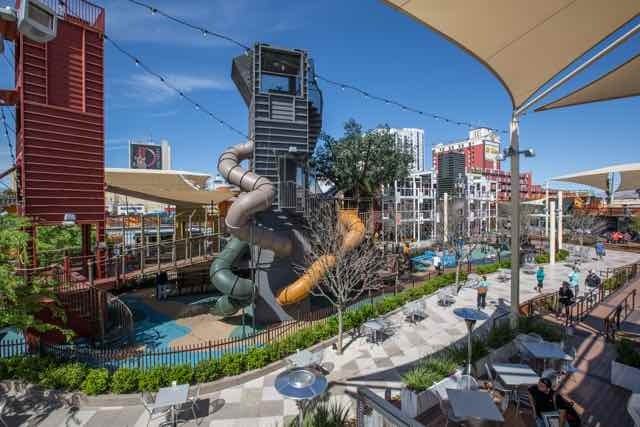 Today, however, Downtown Las Vegas is developing into a well-rounded family-friendly location. SlotZilla at Fremont Street Experience in downtown Las Vegas is a 12-story, slot machine-inspired zip line attraction and is one of the best things to do in Las Vegas. 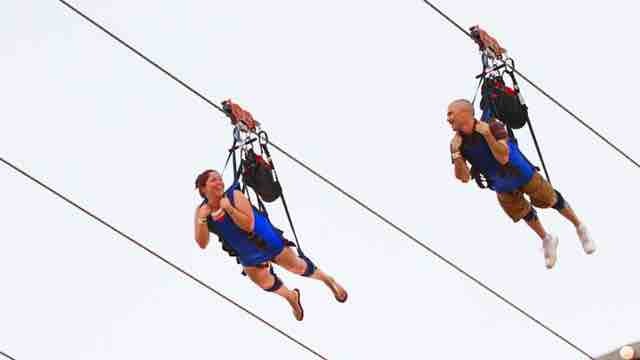 SlotZilla offers two ways to fly, the lower "Zipline" and upper "Zoomline." This one-of-a-kind interactive play area where both children and adults can have fun and be active while exploring their creativity. Special features of the Treehouse include a 33 foot tall slide and aNEOS play system. While at the Container Park, an open-air shopping center filled with boutique retail shops, restaurants, and live entertainment, be sure to try the gourmet hot dogs at Cheffini's and have a cupcake at CupKates. This behind-the-scenes tour conducted by the Golden Nugget marine biologists shows you the inner workings of an incredible 200,000 gallon Las Vegas shark aquarium. 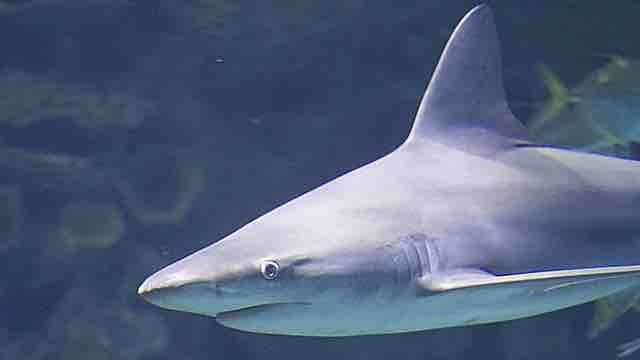 Learn what sharks and fish dine on and how the feeding process works. You'll even go home with a souvenir shark tooth. 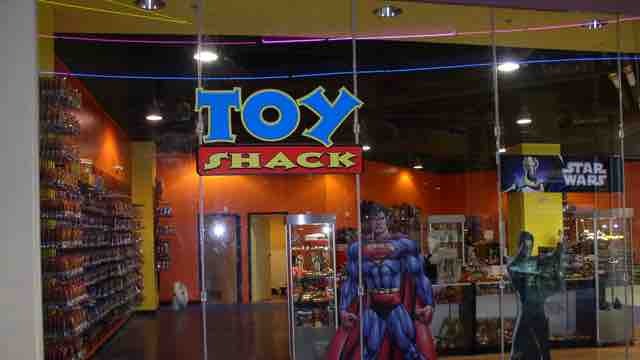 The Vegas Toy Shack specializes in vintage toys from the 80?s. Transformers, GI Joe, TMNT, M.A.S.K and much more. Each evening watch the world's tallest and biggest lightshow at Fremont Street Experience. This four-block long canopy covers downtown Las Vegas and serves as a display system for the shows. The canopy houses 2.1 million lights, capable of producing millions of color and concert-quality sound. 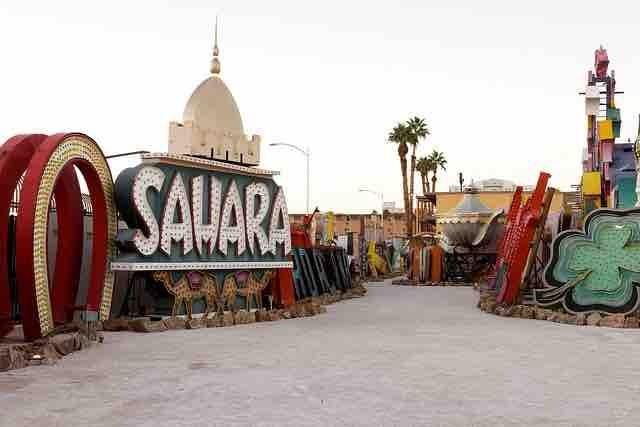 This two-acre musuem consits of 150 old neon Vegas signs housed in the Neon Boneyard Park. Neon Museum Boneyard is only available to the public through an hour long guided tour. Tours are available seven days a week and tour times vary based on the season. So you like beef jerky? But have you tried exotic jerky made from Alligator, Buffalo, Ostrich, Elk, Kangaroo, or Beef Jerky Milk Chocolate? This Zagat rated store will surprise you with its vast seletion of jerky and dried fruits. Ever wonder what $1 million looks like? Here you'll not only see a million dollars but take a free picutre with it in the background. If you love animals Las Vegas Natural History Museum will make for a fun few hours. At the museum you'll encounter dinosaurs, whales, sharks, and wild native Nevada animals. The Mob Museum is a world-renowned, award-winning, must-see destination. This Las Vegas attraction sees over 500,000 visitors hailing from all 50 states and nearly 35 countries in its first two-plus years. Artifacts integrated throughout the Museum?s interactive exhibits provide an insider?s look into many of organized crime?s biggest names, including, Al Capone, Dion O?Bannion, George Moran, Charlie ?Lucky? Luciano, Meyer Lansky, Ben Siegel, Sam Giancana, Joe Bonanno, Frank Rosenthal, Mickey Cohen, Tony Cornero, Whitey Bulger and John Gotti to name just a few. Three-stories tall in stature, the Discovery Children's Museum 58,000-square-foot building is home to nine-themed exhibition halls totaling 26,000 square feet of interactive hands-on core exhibits. The musuem location is a safe, easily accessible, family-oriented destination.